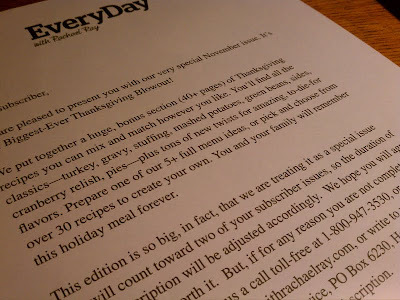 Recently I subscribed to Rachael Ray's "EveryDay" magazine. I just opened the November issue and found a letter included saying they put a bonus section of Thanksgiving recipes in and, "This edition is so big, in fact, that we are treating it as a special issue that will count toward two of your subscriber issues, so the duration of your subscription will be adjusted accordingly." They go on to say they hope I will agree, but if not I can contact them and they will credit my subscription. I'm a little puzzled why it's incumbent on me to do something to actually get what I've already paid for. That's a very odd way of doing business. I thought it was a big no-no to make customers have to act in some way to prevent being charged for something. Essentially, that's what happening. I thought that was illegal. I'm sure they know otherwise. I doubt I'll bother to email or call or write. But I also probably won't ever subscribe again. It was an experiment for me. I guess I would consider it a failed one at this point. Of course, few people will call or email and that's what they're counting on. More than anything, I'm shocked that a national magazine would get itself into a position where they need to make such a move. It seems there would be tons of safeguards in place to prevent it. Or, I wonder if it's just an ingenious way to cut the number of magazines they're committed to. Printing a letter is far cheaper than printing a whole magazine. Regardless, I don't like this business model. At all. Who knows how else they've decided to adjust this subscription or other things I've paid for, and I've missed the notification. I am so not impressed. Needless to say I tossed out the multiple-year subscription noticed included with the letter. A nice way of saying... "Hey, if you loved having us screw you over this time, sign up for more of it!" Obviously, they need to cut costs, which doesn't bode well for the future of the publication anyway. Ironically, this is the first issue I've taken out of the plastic. So, their first communication with me is that they're reducing my subscription. I realize this is petty, but I am curious about what happened behind the scenes that led to this letter. I have a feeling there's an interesting story there. I wonder how Rachael Ray, who's name and photo is on the magazine, feels about it. I'm guessing she had very little to do with the decision making process that ended up at this place. Putting out a magazine is quite an involved process. It wasn't like they got ready to send it to the printer and realized, "oops... there are forty more pages than we thought." They must have had advertisers pull out or something. I am mighty curious. Subscribers are not where they make their money, but they sure need the subscriber numbers to pull in advertisers. I guess it's the old catch-22. Seems like in 2011 companies would know honesty is the best policy. You are not the only one who was a little puzzled with the letter that was in the November issue. I opened mine at lunch the other day and my coworkers and I had quite discussion about this. I did call the customer care number and to voice my "dissatisfaction" While I was at it I also cancelled my subscription and asked for a refund. It was incredibly bizarre... I can't imagine this was the best thing to do. I totally agree....I have been subscribing to this magazine for years and I too will NOT be renewing.. This is the most ridiculous thing I have ever seen in a magazine. bye bye Everyday with Rachael Ray!! I'm amazed this was the decision they came to. There must be some desperation going on.